I thought I had the perfect recipe for scrambled eggs. But I was wrong. It’s not perfect, apparently, it’s wrong! Or maybe you already know but didn’t tell me. Haha. Well, what I’ve learned is that by seasoning the eggs with salt and whisking the eggs before cooking, it will result in the protein structure in the eggs to break down and lead to watery scrambled eggs. Without the salt and the whisking, the eggs will naturally cook to perfection – creamy and delicious. Sometimes, a little bit of cream is added at the end to stop the cooking of the eggs which I don’t bother because I don’t usually have cream lying around in my house. Baking some sausages and frozen hash browns to go with the scrambled eggs. 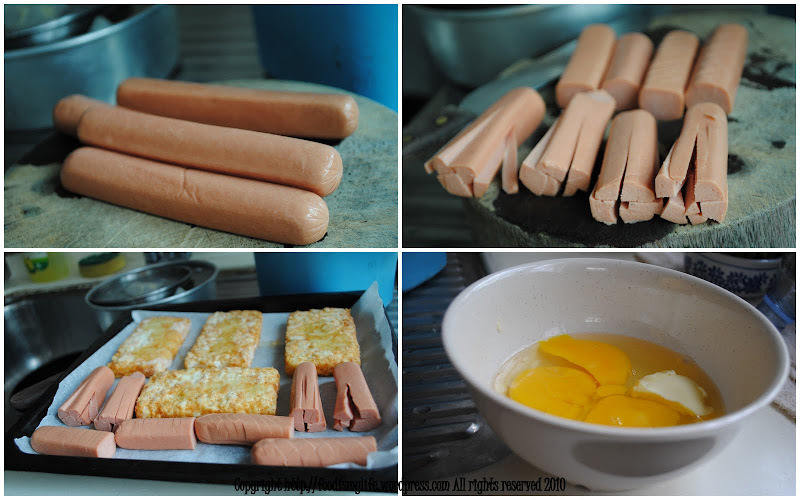 I normally avoid using sausages but I was too lazy that day and my refrigerator was depleted of other options. I like to cut up my sausages and give them a good scoring (cuts) because when they bake, they will open up and look very lovely and cute, like the very first photo above! And the person to thank is actually Gordon Ramsay. I saw a YouTube video of him cooking his perfect scrambled eggs – oh and I’m in love. In a food way of love, you know? By the way, video is attached below! I realise that the thing with a lot of recipes and cooking shows is that they don’t usually explain the rationale of why they do this. They assume we readers/TV-viewers know why they do it. Why add baking powder? Why add so much sugar? Why don’t add this first and add that later? Why why why? Okay, I think you get what I mean. So, when I watched the YouTube video, Gordon Ramsay explains. He explains why we shouldn’t add the salt, and why we shouldn’t whisk the eggs. Well, from the Biology classes I’ve taken in secondary school, I’ve learned that eggs are mainly made from protein and upon heating, the protein structure will change and form a new protein structure. So my guess is that adding the salt and whisking the eggs before heating will disrupt the formation of certain protein structure and thus will not give rise to creamy scrambled eggs. Hmm… sounds plausible, huh? All you need is 3 eggs (3 eggs per person), a dollop of unsalted butter, some salt and pepper, and some cream (optional)! Break the 3 eggs into a non-stick pan or the one seen in the video. Add a dollop of butter and set the pan over medium heat. Using a spatula or wooden spoon, stir the eggs, non-stop, until the eggs are beginning to harden. Take the pan on and off the heat if necessary. When it’s of a consistency that you like, you can add some cream to stop the cooking. and i like the criss cut sausage, looks so cute la! thanks for tips roomie. i feel hungry! i need to start to learn how to cook! haha! might try this 😀 looks simple enough! Oh my god really? That is like so cool, I wish NTU has such a course and I’ll definitely be the first to take it. 😀 Haha goodie good, means when you come back you can teach me all about the science of cooking! (: How’s school over there?